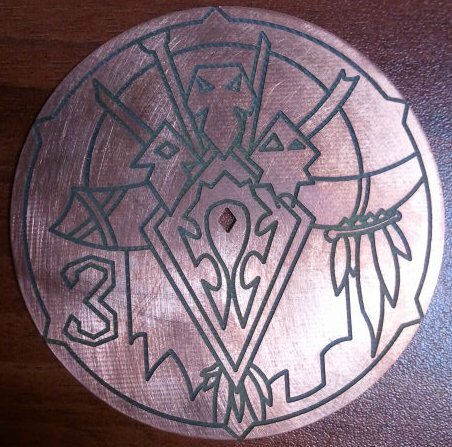 One of the things that I wanted to get for my Hordebloods army were custom templates. I did a bunch of planning on how I wanted everything to look, and then started hunting for companies that would be able to handle the job. There are a number of people out there that promise some nice looking services with different coloured plastics, multiple colours and even felt backing. Not to name any names, but after talking with a number of businesses, nothing was going anywhere. Communication was poor and mostly people just stopped responding while we were trying to figure out the details... Maybe I was asking for too much? I wasn't just looking for templates, but also Fury counters and tokens to represent the many buffs available in a Troll army. AKA, I was looking at spending a decent amount of $$$. But if you can't handle my request, don't ignore my followup emails - just tell me that what I'm asking is too complicated for your business. Now instead, I decided to make my own templates. You see, when I got married, I ordered a bunch of nice leather USB keys and designed some chains in AutoCAD, which I then cut out of printed circuit board. 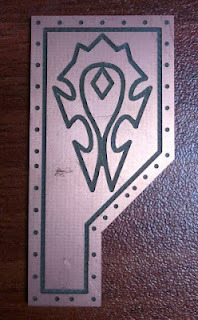 (PCB) I was able to do this because my dad designed and built a CNC machine that can cut PCB, wood, light metals, etc. I just load in my design, and it cuts it out. Pretty cool stuff. This past weekend I was in town and we sat down to cut the first draft of some templates for my army that I've been working on. 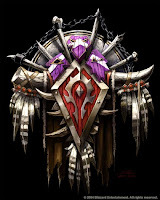 The blast templates I've styled off Blizzard's Horde crest pictured to the right. Each will be the same design, just in 3", 4" and 5" diameters with a different number to signify their size. 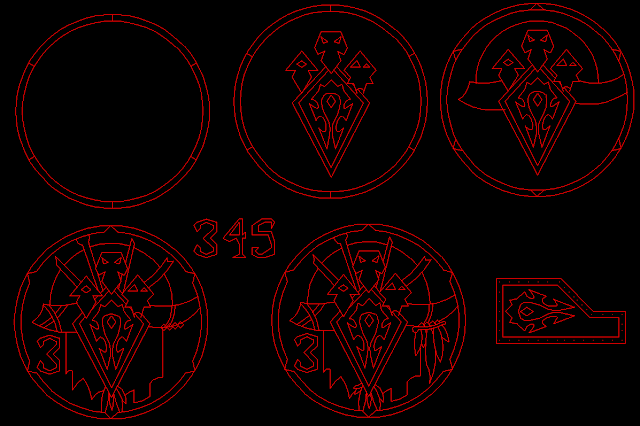 Yup, I even created the little combat token... one side is 2" long, another is 1", and the smallest is 1/2". As I said, these are the rough designs. The diamond in the center of my blast template isn't very big to see through for targeting and I might have to drill a larger hole. Might keep the combat template as is though, which means I just need to buff it up. Oh, and if you do use something like PCB or copper, then don't forget you can always patina it like my Khorne standard. One important note is that when you're doing cutting like this, the bit MUST be offset. As demonstrated by the following diagram, you need to take in to consideration that the bit has a diameter of its own. Shift the cutting bit over by a distance equal to the radius of your bit. Sometimes this doesn't matter, but when you're making templates for wargaming, dimensions must be EXACT. If you don't compensate, your template could be a little small, but if you overcompensate, too big. We all know the sort of arguments THAT could lead to.